Another 'Throwback' to Paris Haute Couture with some wonderful backstage moments on Giambattista Valli Spring/Summer 2014 Haute Couture. 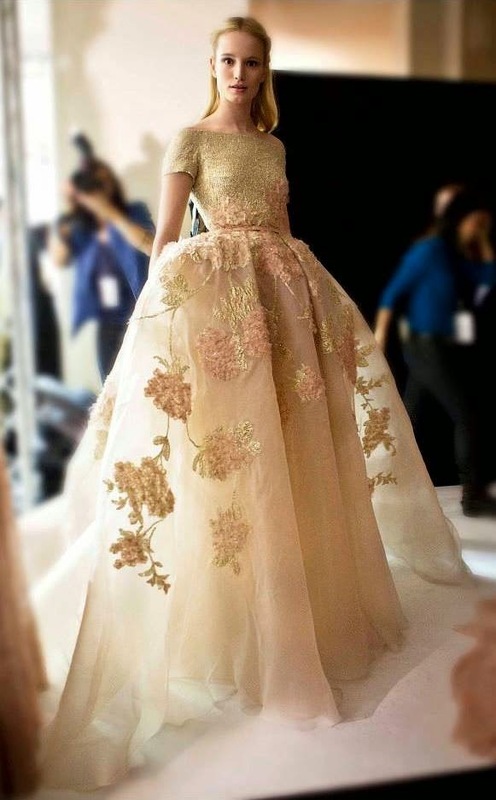 Discover these amazing Spring 2014 Couture collections & runway shows of Stéphane Rolland, Alexandre Vauthier, ELIE SAAB, CHANEL, ARMANI Privé, Zuhair Murad, Giambattista Valli, ALBRECHT OLLENDIEK, VALENTINO, DIOR, Atelier Versace at the end of this post! When Giambattista Valli landed on the couture schedule six seasons ago, he didn't so much set out to rewrite the rules as he did to inject the made-to-measure world's rarefied confines with a young energy, aided and abetted along the way by his photogenic front row of international jet-setters. Rarely, though, has Valli's magnificent obsession with youth been more apparent than it was for spring 2014, with his emphasis on a short, supremely leggy silhouette and what he called a "spontaneous attitude." Valli's fabrics and embellishments tended toward the dense and heavy, the polar opposite of Raf Simons' work at Dior today. By the same token, the color palette (especially that vivid blue and pink on black) and the voluminous, peplumed shapes owed a noticeable debt to Simons' debut at DIOR July 2012. 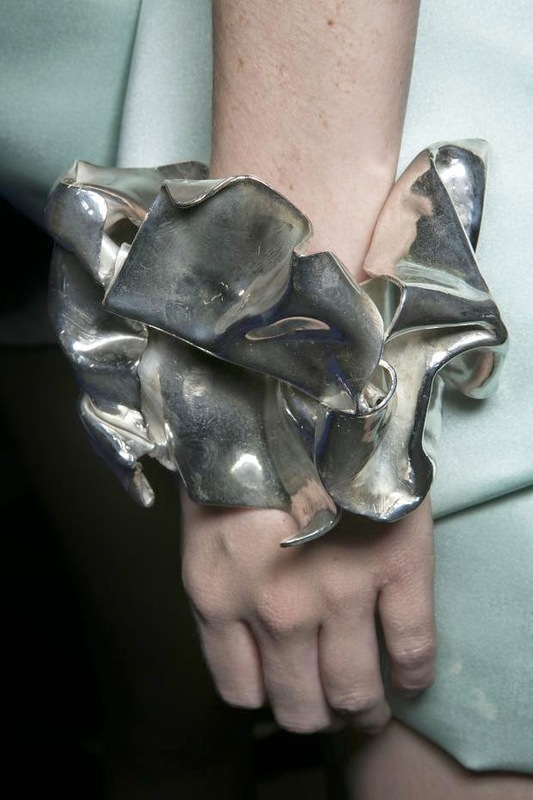 More Couture To Love ... by clicking on the links! 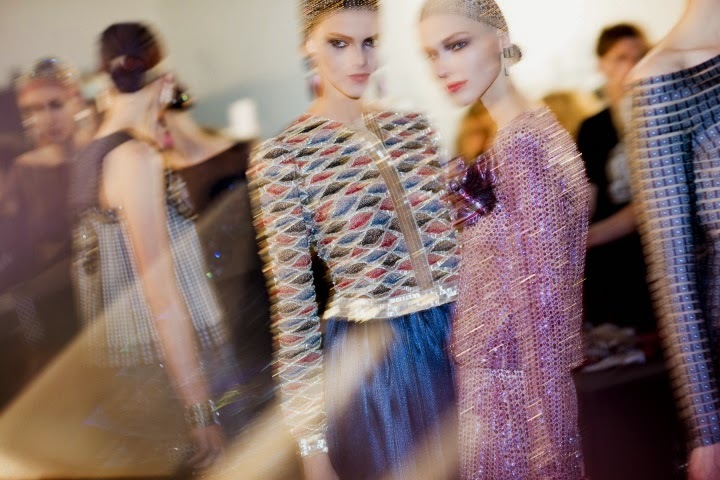 Throwback to Paris Haute Couture with some of my backstage moments on VALENTINO Spring/Summer 2014 Haute Couture. The Stéphane Rolland's Haute Couture collection, for Spring/Summer 2014, is a real sunset. A warm color palette, from orange mango to yellow, mixed with tangerine, saffron and a touch of black and white. The models' silhouette is wrapped in garments that resemble sculptures without ever appearing rigid. 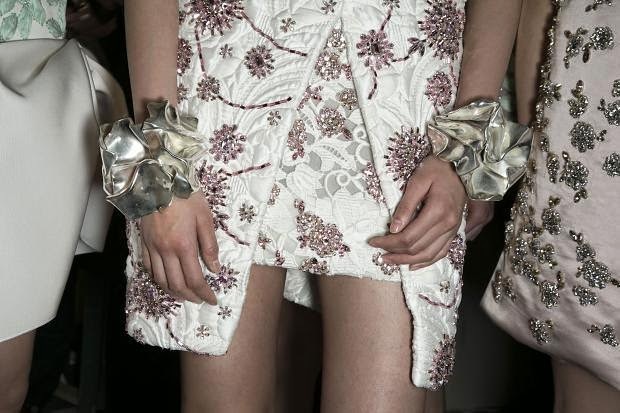 Alexandre Vauthier pumped up the artistic side of his Spring/Summer 2014 Couture collection. Braided leather added edge and texture to his body-hugging looks, while macramé tops and dresses — some were entirely knotted from hand-woven ropes — gave off an ethnic flair. Alexander Vauthier is somewhat beach-bound, giving surf gear a sleek revamp, sans a pair of sunglasses or a neon bikini in sight. INSPIRED by the work of Sir Lawrence Alma-Tadema, the nineteenth-century Dutch artist painted scenes from the Roman Empire. His subjects always seemed to be reclining amid marble statuary, and there was a good chance that the Mediterranean Sea was shimmering in the background. Minimalist staging set the tone for the Chanel Spring/Summer 2014 Haute Couture show. Beneath the domed glass ceiling of the Grand Palais, a stage consisting of glowing white walls and polished steel panels revealed a large staircase from which models emerged at the show’s opening. The fashion proceedings, which you see here, were centered on two of Giorgio Armani’s career-long themes: his interest in Asian cultures, filtered through his deep love of early black-and-white movies. Both influences were apparent in almost everything he showed. Inspirations straight from Garden Eden, the mystical garden segment of Zuhair Murad's Spring/Summer 2014 Couture collection overall contained a multitude of camellias, roses, peonies, gentian, and more, all shimmering atop gowns, jumpsuits, and cocktail frocks. Most outstanding: a beautiful strapless dress with a pale ivory whoosh of tulle skirt and a pale pink bodice with a veiled flower embroidery, anchored with a deep black ribbon, tied in a bow. Some days before Paris Haute Couture Week, I relished an exceptional couture moment with Albrecht Ollendiek in his Frankfurt based haute couture showroom. A very private appointment in a very private space of haute couture - Saalgasse 10, Frankfurt. So excited, because Albrecht is one of my favourite couturiers since more than 15 years and his annual couture shows at Schlosshotel Kronberg are renomed as a fashionable highlight in the Rhein-Main area. 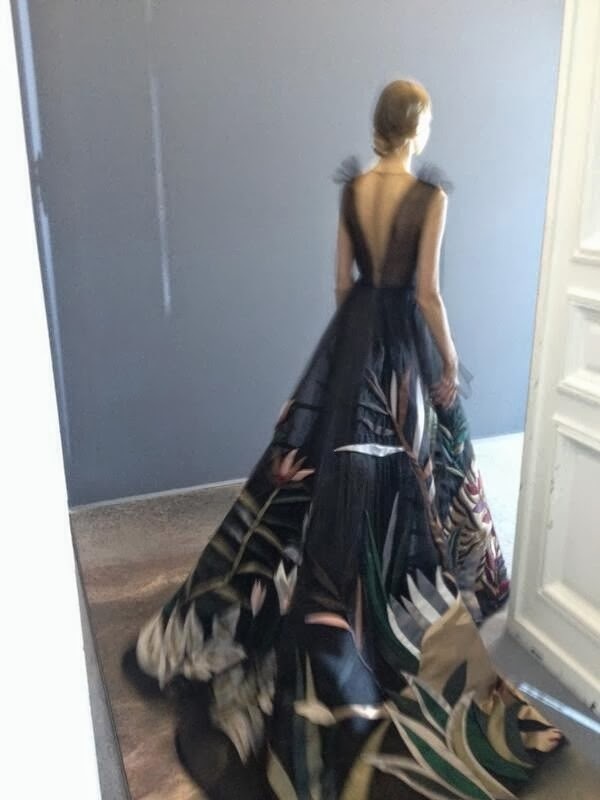 The design duo of the moment, Maria Grazia Chiuri and Pierpaolo Piccioli took their inspiration for the VALENTINO Spring 2014 Haute Couture from "the most fantastical Italian opera possible". They took us in a "beyond exquisite" embroidered flora and fauna - Garden of Eden - the runway was a special hand painted catwalk, painted by the Roman operatic house. 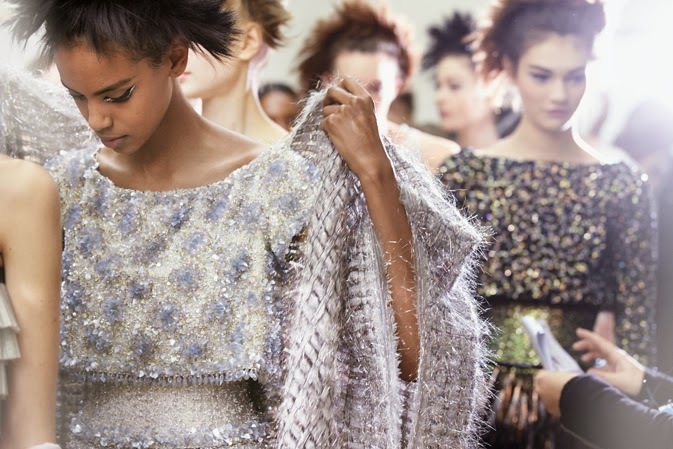 When Raf Simons arrived at Christian Dior nearly two years ago, he had to personally meet every single member of the ateliers who painstakingly labor to create things of such lyrical beauty that oftentimes it barely looks like a human hand has ever touched them. Flash ahead to this week, and Simons used his exquisite spring 2014 couture to honor all that les petites mains do at Dior. "A juxtaposition of glamour and mystery, with cinched-in poise meeting the fluidity and provocation of Grace Jones. Different ways with draping: sculpted and controlled to highlight the lines of sleek tailoring, or liberated and sensual for fluid silk jersey dresses."